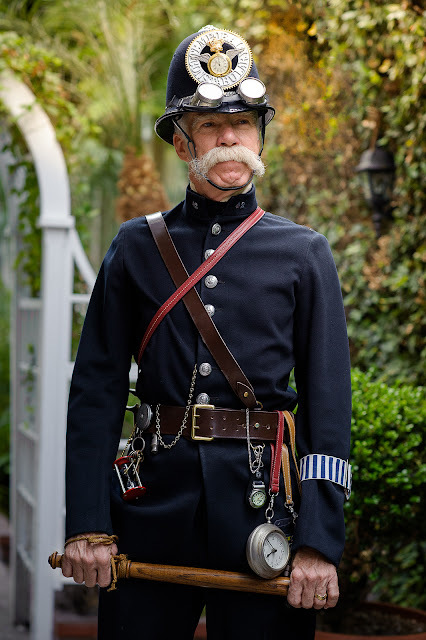 At first glance we thought this was a photo of a cheerful Steampunk bobby, an apropos character choice given that Sir Robert Peel's London police force was created just 8 years before the Victorian era began. But on closer inspection, we noticed something more sinister. Notice the various time-keeping devices on his belt, including an hourglass. His hat, known as a custodian helmet, bears the emblem of a clock with wings, and the words "Temporal Constabulary." This is no run of the mill British bobby strolling the area to keep the peace. This is a member of the Time Police. Time travelers, you've been warned.